Another long week. The new administration seems intent on creating chaos. They’re checking things off their list that have to do with a fear agenda — unconstitutional Muslim ban, helping big business, rolling back protection for citizens, the environment etc. What has been done in the first two week that helps the average citizen? Nothing. Healthcare or education? Nope. Safety or economic relief/jobs related? Nope. The good news is that the majority of people in the US (and World) don’t agree with what Trump is doing – just like the majority of American’s didn’t vote for him. The last couple weeks have also been a wakeup call for a lot of people and I think we’re getting more vocal and active then ever. I love what the site Wall of Us is doing, and they have a page to track the good things that have happened from collective citizens standing up for democracy. Portland landlords must pay relocation costs to evict tenants without cause – Portland City Council passed a new housing policy this week that requires landlords [with more than one rental] to pay the tenants it evicts without cause. The amount is $2,900 (studio) to $4,500 (3 bedroom) given to tenants who they evict without cause or who have to move as a result of a rent increase of 10 percent or more in one year. The full policy is here. I agree with the intent of the ordinance, but I have a lot of questions. Overall, as a previous renter, landlord, and home-owner this policy concerns me a bit. First, it paints landlords as the enemy of renters – that they’re rich, soul-less, and money-hungry. I’ve been a landlord to a spectrum of tenants and I’ve been a renter from a spectrum of landlords. Nuance. Try it! Second, I think that most landlords aren’t getting rich off anyone (thankfully this policy doesn’t impact single-tenant landlords). From my experience, there are a lot of people who are “accidental landlords” after moving or bad market timing, they’re just barely making their rental mortgage payments, so any extra profit is often going to increased property taxes (property taxes went up 4.5% on average in 2015), repairs etc. Third, there’s a lot of vague wiggle room in this policy. So it’s for only single-tenant landlords – how do you prove this? How is this enforced? Is it up to the renter to file a claim with the city? Does it go through the court system? What if the landlord doesn’t pay? DO: Ask our Mayor Ted Wheeler and champion of the Relocation Assistance Ordinance Commissioner Chloe Eudaly to create an example sheet and FAQ of what this policy looks like in impacting real people. For example: have 10 different use cases from both the tenant and landlord perspective – how the policy works, what happens when and how etc. Portland Winter Light Festival – In the depths of winter we could all use a little light. 😉 Last year was the first I had heard of the Winter Light Festival, and it was such a fun event to meander through. It’s a really interesting combo of art and science into light (and often sound). They had another festival for 2017 and it seemed even bigger than last year. DO: Check out this week’s items and do one! Specifically this week, I’m planning to continue this one. This Week’s Actions: This week, I sent emails, called, Tweeted @, and signed petitions to my Senators and House rep, and a Senate committee about issues that were important this week; emailed and Tweeted @ a few companies that I use that haven’t taken a stand on the Muslim Ban. I tried and failed to stay off Facebook, but did post comments addressing lies and fake information as I felt comfortable with; and started reading Rest in Power – The Enduring Life of Trayvon Martin. Yesterday was so inspiring. Millions(!) of women and men turned out around the world to stand up and say “hey, we’re still here!”, and that we’re united in the fight for equality and decency for all people. All people. 100,000 Portlanders came out! In the pouring rain, naturally. This is just what I needed after Friday. 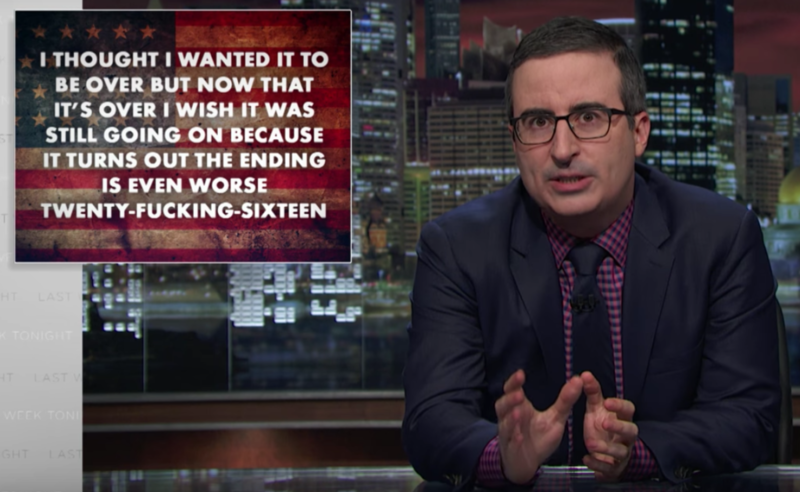 Friday was a day of mourning for many reasons. I’ve had trouble putting my thoughts into words and sentences. This is my first blog post of 2017. I started this blog to talk about the positive and what I can do to make things better in my community and on a local level. Yesterday was much needed inspiration. This is what democracy looks like. This is what can happen when millions of people make a statement. This is what the future looks like. 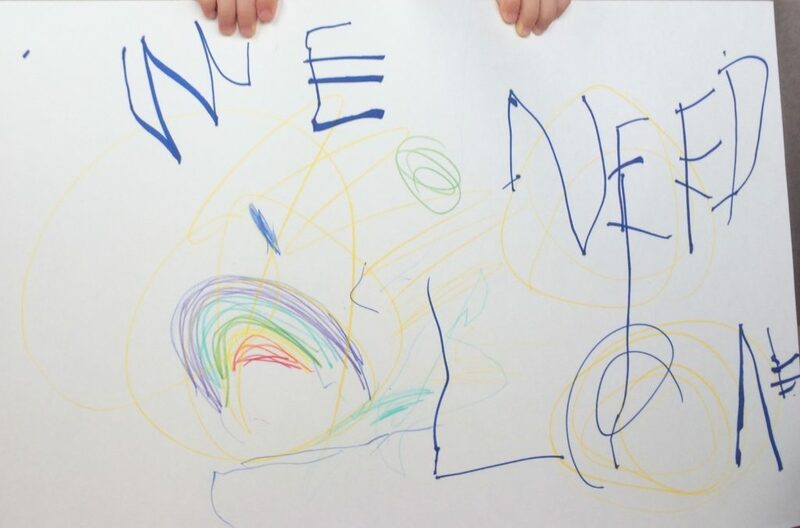 Seeing my 3 year old niece with her sign “Make America Kind Again”, which she later decided said “Be Kind, Love a Balloon” instead, gives me hope for the future. Now What? We must continue taking action. Yes, it’s great and inspiring to see millions of people marching. 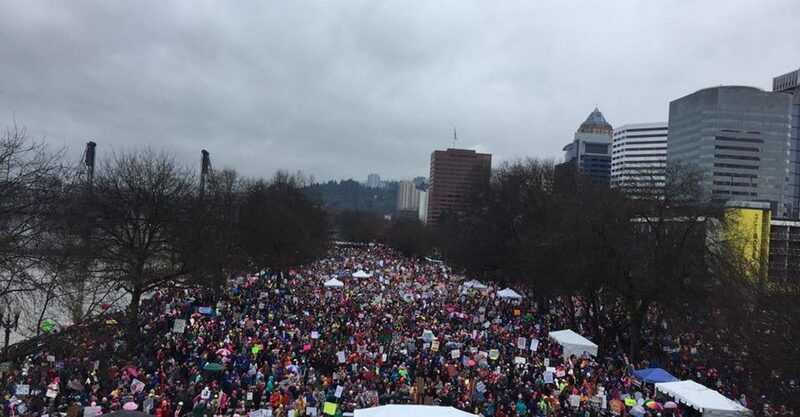 100,000 people in Portland. If we 100,000 continue to take action, think of what we can accomplish! There are more kind and forward-thinking people in the US than not. But we have to keep moving and taking action. DO: Here’s where Oregon stands on the National Popular Vote bill. It has died in the Oregon senate previously. Contact your local rep. In North/North East Portland, that’s Lew Frederick and ask them to support it. 4 Big Themes for Cities in 2017 – I love City Observatory’s posts on urban living, planning, policy etc. They’ve outlined some things they’ve learned in the last few years. 1. The growing economic importance of city centers. 2. The shortage of cities. 3. 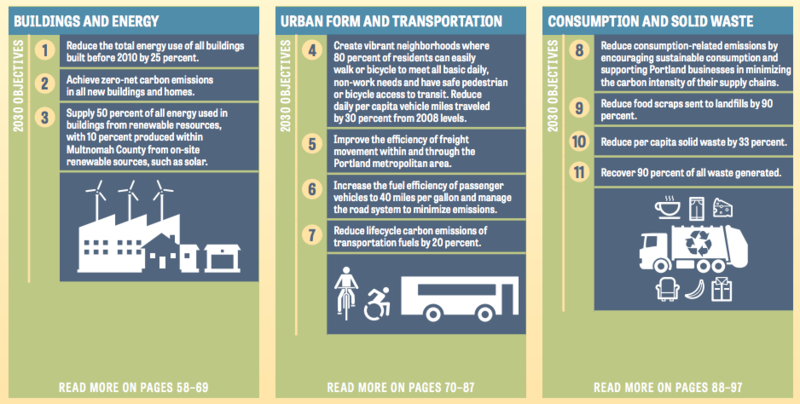 The need to rethink transportation policy. 4. 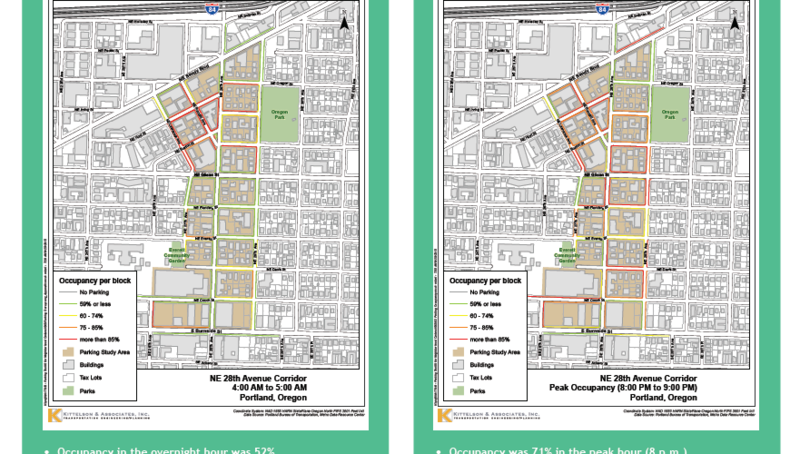 The challenge of segregation, integration, and neighborhood change. DO: Read through at least one of the links they’ve included in this post. I’ve learned a lot by reading their research and writing, some of which challenges my assumptions. We all have a lot to learn and it’s fascinating. DO: Our Senators in Oregon already have our backs. Since nothing has actually been suggested by Republicans yet, I’m not sure what we can do, other than staying up-to-date on what’s happening and what smart and informed people like Bernie Sanders are recommending. Portland Police Launch Tear Gas [Pepper Spray] at Anti-Trump Protesters in Pioneer Courthouse Square – Portland police seemed quite proud of themselves for their use of restraint at the Portland Women’s March. The night before they chose not to use as much restraint. I think we need to be really careful in our assumptions of “right” and “wrong” ways to protest and how different groups are treated by the police. DO: Ask questions of our leaders. Read and watch video of what has happened. I don’t have the answers here, but I do know that this difference in treatment doesn’t feel right. How do we find the balance between right to assemble/expression and protection of public space from a few destructive people who hide in these assemblies (like what happened in downtown in November)? This Week’s Actions: This week, I attended the Women’s March on Washington in Portland, emailed my local Oregon Senator for North Portland about the National Popular Vote bill, and read and researched upcoming changes and current issues facing me as a Portland-citizen and on a national level. Such an interesting way to see what’s in between “Place” and the step we usually jump to: measurement. DO: It sounds like the city had a rescheduled hearing on the inclusionary zoning mentioned in this article. There should be an update at some point here? 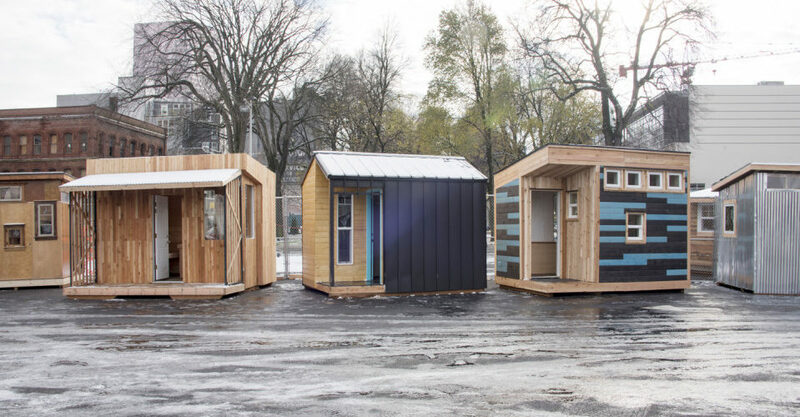 DO: Guerrilla Development has done some really interesting projects in Portland. Check out some of their work and their crowdfunding development project. Curious how these projects will look in a few years. DO: Check out the full 10-part series called “How to Build the Perfect City”. DO: Check out their Inspiration Toolkit for ideas of local things you could do. DO: Do you know some of Portland’s privately owned public spaces? This Week’s Actions: This week, I donated to a local nonprofit through GiveGuide and to IRC to support Syrian refugees, and stayed off Facebook (40 days now!). This is the last post of 2016, since next Sunday is Christmas. See you in 2017!